your junior members...and introduce them at the same time to the magical world of live theatre. The venue is The Growing Stage, The Children’s Theatre of New Jersey, located in the very child friendly Palace Theatre on Route 183 in Netcong. 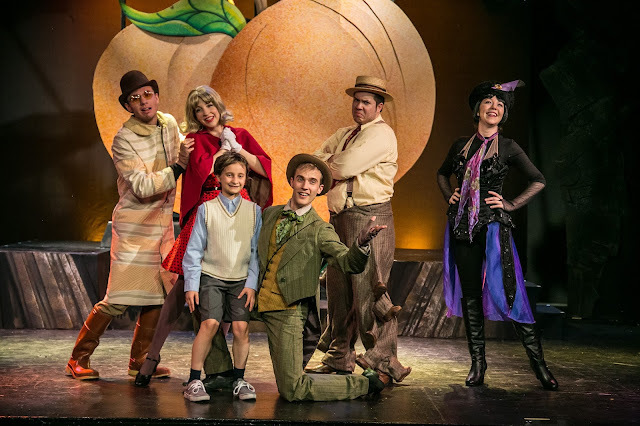 The production is the New Jersey premiere of the musical version of JAMES AND THE GIANT PEACH. Based on the book by Roald Dahl, JAMES AND THE GIANT PEACH, has Music and Lyrics by Benj Pasek and Justin Paul and Book by Timothy Allen McDonald. The play is under the fine direction of Stephen L. Fredericks, The Growing Stage’s Executive Director with musical direction by Stephen Fox and Choreography by Jillian Petrie. The charming plot revolves around James, (Danielle Becht), a young newly orphaned English boy, who is sent to live with his only living relatives, two greedy, conniving Aunts, Spiker (Martha Harvey) and Sponge (Lori B.Lawrence). They only agree to take James for the money and free labor. The Aunts quickly demonstrate that they are despicable villains, albeit amusing, with the song, “Property of Spiker and Sponge,” When James is sent by his aunts to chop down their old fruit tree, however, with the help of the mysterious Ladahlord (Robert Allan) he discovers a magic potion which results in a giant peach. Suddenly, James finds himself in the center of the peach among human-­sized insects, but after it falls from the tree and rolls into the ocean; the group faces hunger, sharks and plenty of disagreements. Thanks to James’ quick wit and creative thinking, the peach residents learn to live and work together as a family. Naturally, it all ends happily, except for the Aunts who return to their chosen profession as boardwalk thieves (master pick pockets). The music and dancing are charming, the sets are attractive, the costumes are colorful and time appropriate, but the production rises to four stars mostly due to the impressive talents of seven professional equity performers and two outstanding community artists. First, is Danielle Becht (photo right), making her Growing Stage debut as the hero James, this young lady (yes... James is beautifully played by Miss Becht who at an early age already has an extensive resume). Robert Allan has great fun as Ladahlord, who mysteriously leads James to a better life, he also serves nicely as a guiding narrator throughout the story with several cute sight gags; Lori B. Lawrence and Martha Simmons Harvey are terrific as Aunts Sponge and Spiker. Nasty, but funny, and clearly not threatening to a young audience, Spiker is the brains whereas Sponge is more concerned with finding something to eat. Rounding out the fine cast as the insects and various other characters are: Jeremy Feight as Earthworm, a gentle spirit who is a bit of a coward; Izzy Figueroa as Centipede, loyal but a bit of a grouch; Cara Ganski as Ladybug, who takes on a maternal role in James’ life; Robert Mintz as Grasshopper, the ever optimistic leader of the Insects; and Casey Low as the clever, fun­loving Spider. Director Steve Frederick's excellent creative team includes: choreography Jillian Petrie, musical direction Stephen Fox, Perry Arthur Kroeger scenic design, mask design and painting, Becky Nitka sage manager. 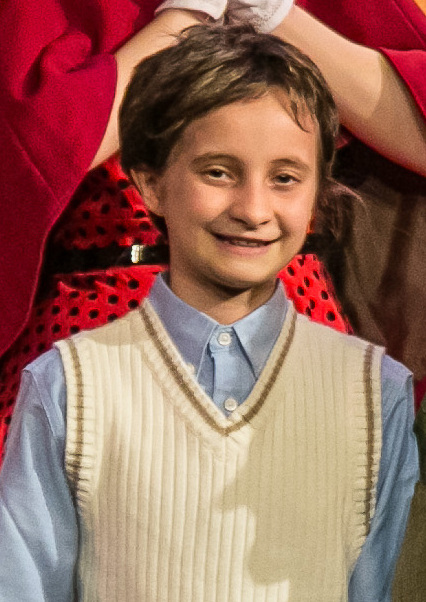 JAMES AND THE GIANT PEACH will be performed through April 3rd on Friday Evenings at 7:30 pm, and Saturday and Sunday at 4 pm. All Friday tickets are $15, Saturday and Sunday tickets are $25 for adults, $20 for seniors and $15 for children. The theatre is located at 7 Ledgewood Avenue, Netcong, NJ 07857. To purchase tickets, visit www.growingstage.com or call the Box Office at (973) 347-4946. Group rates and Birthday Party packages are also available.